Dee Dee Bass Wilbon is a partner at Bass Public Affairs, a firm based in the Washington area. She is co-founder of GROWTHComms.com, a communication conference for conservatives who want to have an impact on media with common sense. Initially, the boys were condemned by the left and the right. More video of the incident, however, revealed the boys were not the instigators. After that hasty condemnation, some high-profile figures actually had the grace to apologize for their rush to judgment about the boys from Covington Catholic High School in Kentucky and their encounter Friday with Nathan Phillips, 64, on the National Mall. When actress Jamie Lee Curtis issued an olive branch, hoping for something as noncontroversial as finding “common ground,” some of her left-leaning followers went nuts. “DID YOU MISS THE MAGA HATS?” Brownworth asked. This is terribly disappointing. I thought you were someone dedicated to honesty and truth and here you are saying a press release convinced you that what you saw was false. What's next–defense of Trump? When it became clear that the white, Trump-supporting teenagers could not be blamed for the incident on the Mall, the left tried to heap some level of responsibility on the boys for wearing those MAGA hats. Throughout the Twitterverse, otherwise intelligent adults are pointing to the hats as confirmation that the boys 1) were asking for trouble and 2) are racists. We do believe that #MAGA and the MAGA hats represent something. Wearing the MAGA hat is not a neutral act. But the left’s “Resist” movement once again is completely missing the point. It’s not a symbol of racism. It’s actually the right’s symbol of resistance to leftist intolerance. When we counsel clients on effective communication, we offer a few key tips on our “Never Do This List.” On the top of the list is “Never compare anyone to the Ku Klux Klan.” Unless, of course, they are in fact the Ku Klux Klan. Milano and many others are making the “basket of deplorables” error. The people who support President Donald Trump and the #MAGA movement largely support an agenda that puts America first. They are people who champion free and fair markets, religious liberty, and tax cuts. This is not double talk or dog-whistling for anything other than free and fair markets, religious liberty, and tax cuts. In October, we had the opportunity to meet with and interview black American college students who were in Washington for a Turning Point USA conference. It was refreshing to see young black students celebrating conservative principles. The one interview that stands out is with a young woman from Denver. When we asked her, “What does it mean to be bold?” she replied without hesitation: “To be bold to me is to wear this hat.” And she pointed to her bright red MAGA hat. 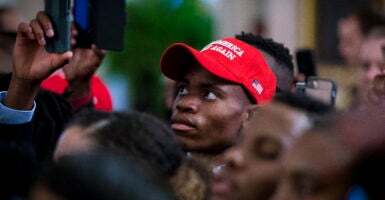 That young African-American woman, and the young teens from Kentucky, understand that MAGA hats make a statement. The left missed the statement in 2016. And to the peril of their hopes for 2020, they are missing it once again.